BlackBerry Onyx prototype pic | BlackBerry Blast! New photos of a BlackBerry prototype called "Onyx" are floating around. The Onyx is supposedly a 3G GSM BlackBerry that looks similar to the Bold, but smaller. The Onyx will likely have a new name by the time it hits AT&T and T-Mobile but should look pretty much like the picture. 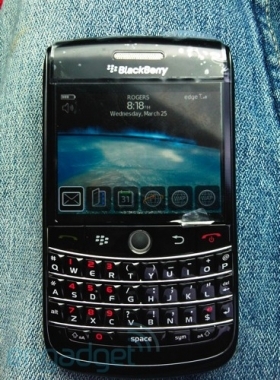 Because this is a prototype the official version won't launch for awhile, but it's good to see RIM is still coming up with new devices.